Being stuck in "design world" for hours left me famished. The good thing is, I arrived at a final book cover concept that the client likes. Just had to take a break, however, and put my Veganishta hat on for lunch. Yesterday, I cooked some pinto beans in the crock pot as usual, with some Nori sea vegetable and a little olive oil in the water. Just love those beans! For lunch today I decided to stir-fry a few extra goodies to mix in with some of those great beans. I had some flat-leaf kale that needed to be consumed, so here is what's for lunch today. Pour olive oil into wok and saute garlic, red onion, and ginger until clear and tender, and top with sea salt to bring out the flavor (thanks Christina Pirello); next add the sliced carrots and saute just a few minutes longer; then add the kale on top and the Tamari on top of the kale; let set in wok for about 10 seconds and then start mixing everything together for just another last minute or two until the kale is wilted and the color comes out brightly. 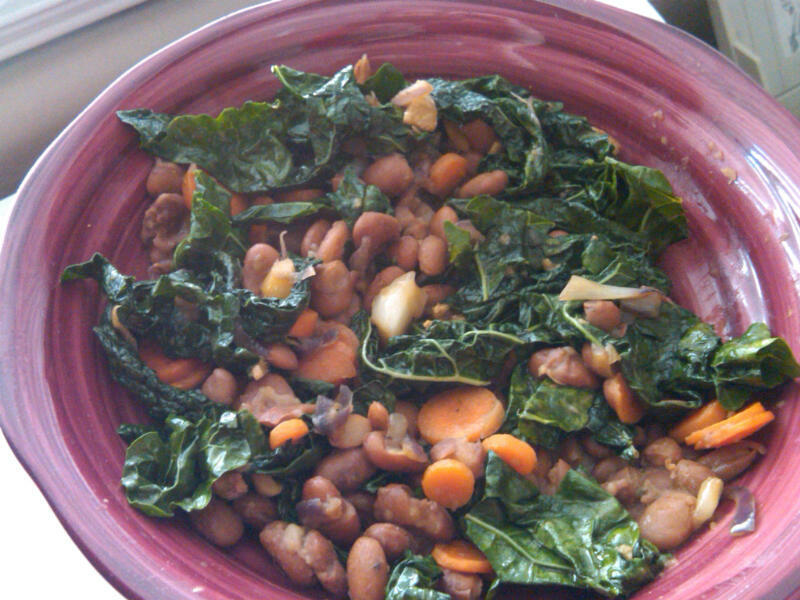 Place kale mixture on top of pintos; top with a few drizzles of brown rice syrup and enjoy.